With a permit already in hand, PT Orangutan Habitat Restoration Indonesia (ROI) is preparing to release orangutans into Borneo jungles after years of being held in rehabilitation centers. The Forestry Ministry awarded a ROI license to restore 86,450 hectares of former timber concession area in East Kutai district, East Kalimantan, to be the new home for rehabilitated orangutans. “We target the gradual release to start in April 2011 at the latest,” chairman of Borneo Orangutan Survival Foundation (BOSF) Togu Manurung told The Jakarta Post. There are currently 226 orangutans held in captivity in the BOSF rehabilitation center in East Kalimantan. The BOSF set up ROI when the government allowed only the company to propose permits for ecosystem restoration projects. He said that the new area was located 750 meters above sea level and well-stocked with tree species to provide shelter and food for wild orangutans. The BOSF also rehabilitated some 612 orangutans in its Central Kalimantan center. Togu said the release of orangutans in Central Kalimantan was expected to start from November in cooperation with timber company of PT Akhates Plywood. “The plan is to return some 40 orangutans back to their habitat in the jungle by November, the forest fruit season,” he said. The company currently proposed an additional area of some 23,000 hectares in East Kalimantan and 200,000 hectares in Central Kalimantan. BOSF chairman of board of trustee, Bungaran Saragih asserted that ROI would not harvest trees in its concession areas. 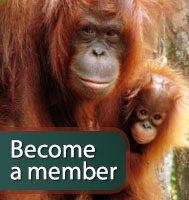 “We are committed to protecting the orangutans. They need forests. They have been living in the rehabilitation centers for too long,” he told the Post on Saturday. Bungaran, who was former forestry and agriculture minister, admitted the high costs to conserve orangutans, whose population sharply declined due to the expansion of oil palm plantations and mining sites, among others. He said ROI would spend at least two years monitoring the daily activities of released orangutans in its new habitat to ensure that they could survive in the area. “We should teach [orangutans] survival skills for the wild. Some have been in the rehabilitation center for about nine years,” he said. The government pledged to release every orangutan into forests. In the last 35 years, about 50,000 orangutans have died due to deforestation and habitat loss, government data shows. About 90 percent of orangutans live in Borneo and Sumatra. It is estimated there are 6,667 orangutans in Sumatra, mostly in the Leuser ecosystem, and 54,567 in Kalimantan, the Indonesian part of Borneo. The remaining 10 percent are in Sabah and Sarawak, Malaysia. The International Union for the Conservation of Nature said the orangutan species native to Kalimantan was endangered. Orangutans in Sumatra are also critically endangered.